There was a lot of back-and-forth in my head trying to decide which boot to get before our trip across the Americas. I knew I needed something new. 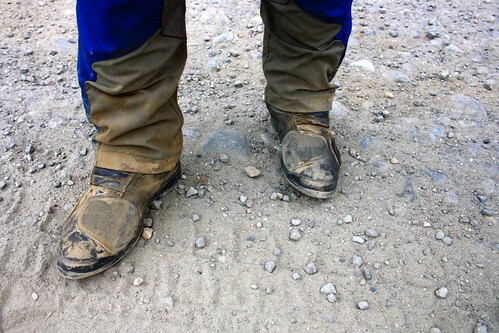 After having ridden numerous times with boots that left my feet soggy and squishy in the portable water bags that my prior boots turned into every time it rained I knew I wanted something waterproof too. And the TCX Infinitys absolutely lived up to that requirement. 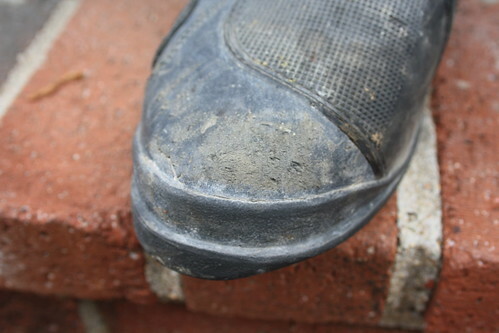 After downpours, drizzles, streams, mud, and more the waterproofing has never left my feet so much as damp. The other major concern was protection. I believe in ATGATT and wanted a boot with armoring in all the right places, including malleolus protection. I almost went with a boot that didn’t have it simply because I liked the looks better. I can say with 100% conviction that I would have broken my ankle and probably killed our trip if I had of made that choice. In two separate instances I dropped my bike and had the pannier corner ram into my ankle right on the malleolus armor. Months later I’m still having pain from it… I fear what the situation would have been without that armor. 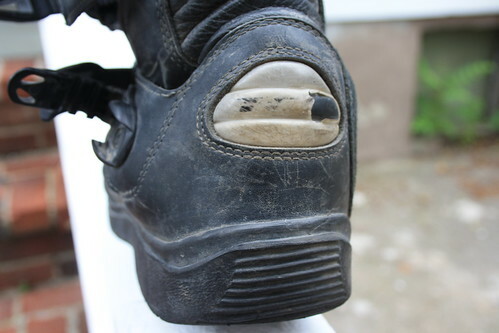 It should be noted that the inside of the boot, near the shifter / brake grip area feels sturdy, but whilst on Routa 40 a number of rocks got kicked up from the front wheel and whacked into the inside side of my foot there, some being ricocheted off the bike. It wasn’t pleasant. However, I’m not sure if any manufacturer does much in this portion of the boot that would help against one pound rocks being hurled at your foot from two feet away. 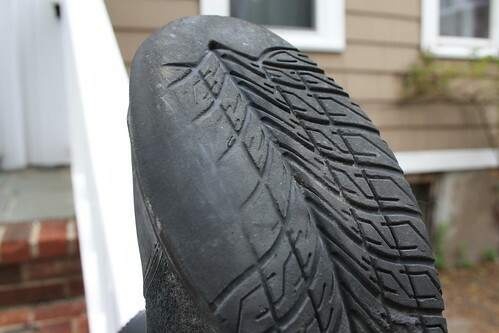 The elasticated section on the top rear of the boot is made out of one of the itchiest materials known to man. I swear that an old-school itchy wool sweater would be less itchy than this stuff. And it doesn’t really get much better over time. I’ve probably walked a hundred miles (without exaggeration) in mine and it’s still itchy. If you get these you *must* get yourself some very tall socks to go with them. I went with tall, thin merino wool liner socks which worked very well as they’re great for wicking, not hot, and resist getting smelly. As far as sizing goes, I followed the sizing guide and it worked for me. My feet fell in-between two sizes so I went for the next size up. When I got them they felt a bit overly roomy, but when the cold weather hit and I put on my thick wool socks the fit felt perfect. After breaking them in they feel great with or without thick socks. The buckles: You’ll hear a number of complaints about the buckles on these. There are two problems one is the single rivet connection point to the front of the boot. I have seen a number of reviews / remarks / photos where this has ripped out. I don’t know if this was due to mistreatment, randomly bad boots, or an endemic problem. I do know that my boots are showing zero evidence that mine will be failing any time soon and they’ve got over 20,000 miles on them. The rear/side section (the clamp arm thing) has two rivets and I’ve never heard of anyone having issues with it. The other problem with the buckles is one that I’ve seen on some Dianese boots and is one you will most likely encounter on any boot that uses a similar ratcheting buckle system. The problem is you find a point along each of the ratcheted strips where the tension is just right around your foot, but when you open the buckle the strip moves… every time. So when you put them back on you have to fiddle to find the right point again. I solved this by getting them adjusted well, then taking my multi-tool and cutting a thin mark into the outside of the ratchet strap. From then on I just slid it in until the mark on the strap was aligned with the base again. The soles are good. 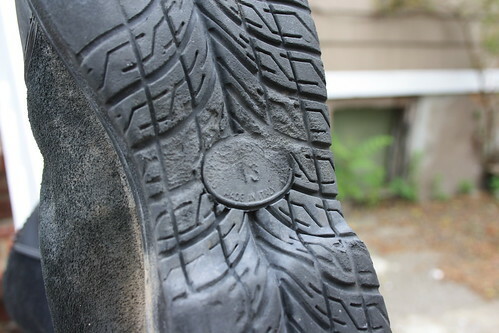 After 20,000 miles with Fastway pegs though, the section where the peg touches the boot has been chewed up, and all the walking has worn away the tread under the heel and the ball of my big toe. However, I think they’ve easily got another 20,000 mile trip in them before I need to re-sole them. If you like the fancy design on the suede insides of the boots, I am sorry to report that it will wear away. If you don’t like it, I am happy to report that it will wear away. The little oval-ish retroreflective piece on the back where it says TCX is a thin piece of plastic over leather. It will fade, scrape up, crack, and eventually start chipping away. Personally I don’t care because it is too small to provide any real safety and I don’t really notice it anyway. So, knowing then what I know now, would I buy them again? Absolutely. Would I pay $400 for them?… maybe. I got mine on sale for something like $300 I think. At $400 I would definitely spend some more time comparing them to other boots looking. But, in the end I believe that these boots will serve you well… as long as you have tall socks.